Beading enthusiasts everywhere are lauding the development of this great new Japanese beading thread (by Master Beader Sonoko Nozue) now available as an alternative to Nymo. K.O. thread is a pre-waxed, colorfast, abrasion/tangle resistant thread, which can be knotted tightly. 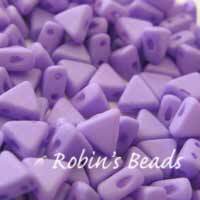 Similar in size to a Nymo size B, K.O can be used with a size 10 or size 12 beading needle. Comes in spools of 50m. Nanofil is a Uni-Filament beading thread. It has a smooth silky feel and is ideal for beadweaving. Nymo is a strong multifilamented parallel nylon thread, slightly waxed and lightly twisted. Available in sizes B and D on bobbins of 65.8m and 58.5m (72 and 64 yards) respectively. One-G is a new thread from Toho. The thread is stronger than Nymo. It does not split easily and passes through Toho beads many times. It feels slightly stiffer than Nymo and is knot resistant and easier to untangle. The thread is available in one size, 300 denier, approximately the same size as Nymo B. Each clear plastic spool holds 50 yards. Silamide is a pre-waxed two-ply twisted nylon thread. It is a very versatile thread and can be used for all beadweaving stitches, loom work, fine crochet (with or without beads) and embroidery. It can also be used for knotting between small pearls and several threads can be used for macrame or braiding. The thread is fine enough to fit through a size 13 needle and is used for any seed beads from size 15 to 6. Comes on cards of 40 yards. Super Lon is a strong nylon parallel fibre thread. It is preconditioned and has a lovely 'silky' feel. S-Lon will fit through a size 12 beading needle and has almost no stretch. It is stronger than Nymo coming close to the strength of Power Pro and can be used for all kinds of beadweaving, both on and off loom. Each bobbin holds approximately 68.5m (75 yards) of thread. Thermally bonded bead weaving thread. Super strong, waterproof and without stretch.